The Thames, Wandle and Beverley Brook rivers run through Wandsworth and provide an important wildlife resource. Kingfishers, herons and grey wagtails are regularly spotted by the riversides, as well as foraging bats at dusk. The Wandle is designated as a “Green Chain” in the UDP, recognising the important link that it provides between open spaces. However, like many urban rivers, its channel has been heavily engineered in the past, with little thought to the potential landscape or ecological value of the river. It often runs unnoticed, despite the fact that it flows alongside King George’s Park. We are working with the planners, developers and other agencies to restore habitat along the river corridor and within the river channel. The River Wandle and the Beverley Brook are already Sites of Borough Importance for wildlife and the River Thames is a Site of Metropolitan Importance for nature conservation. We aim to add to its value for benefit of people and wildlife. Wandsworth Council is the lead partner in the £1.92 million Heritage Lottery funded scheme to deliver a series of improvement projects along the whole length of the River Wandle, from its sources in Sutton and Croydon, through Merton to Wandsworth where it joins the Thames. The over-arching aim of the scheme is to reconnect local people with their river. The programme started in 2013 and will run until December 2017. Catchment Plan – a range of river restoration works to re-naturalise the Wandle and upskill volunteers to design river enhancements. Waddon Ponds – will create a more naturalised habitat for amphibians, invertebrates and wildfowl. Ravensbury Channel – will remove concrete banks through Ravensbury Park which inhibit wildlife; and narrow the river to increase flow. Invasive Species Action Plan – will work with local volunteers to map, treat and manage invasive plants; allowing native wildlife on the Wandle to thrive. Wandle Flowing Through Time – an oral history project combining local heritage and personal memories to capture the history of the River Wandle area. Wandle Estates – communities living in social housing near the River Wandle are invited to get involved and have their voices heard on river issues. Discovering the Source of the Wandle – volunteers will help develop a self-guided walk so visitors can uncover the story of the source of the Wandle. Reflecting the Wandle – a community performance art project celebrating the River Wandle, using fictional and personal stories. River Celebration – celebrating the start and end of the programme to coincide with World Rivers Day on the last Sunday in September. Piscators Youth Section – coaching young people in the Wandle Valley to give them the skills they need to enjoy fishing and to learn to love the Wandle and its wildlife. Wandle Gateways – creating ‘gateways’ along the river to connect people and places along the upgraded Wandle Trail. Merton Priory Chapter House – creating a dramatic new glass-fronted entrance opening it to public view and enhancing facilities to make it an important educational and community resource. Morden Hall Park Wetlands – improving access to existing paths and bridges through the wetlands, river bank improvements and the creation of a boardwalk with a pond dipping platform. River Education – will create teaching packs to introduce children to wildlife which can be taught beside the river and brought back into the classroom. 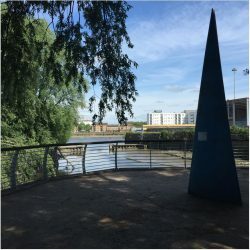 Industrial Heritage Recording – comprises three separate projects with the aim of mapping, interpreting and recording the significant industrial heritage of the Wandle. Interpretation Strategy – comprises three separate projects with the aim of setting out a communication strategy that creates a clear brand identity and a common voice for the Partnership Scheme. Climate Change Awareness – will show examples of what is being done in the valley and what can be done along the river to adapt to the effects. River Guardians – showing residents how to recognise different types of pollution through a series of clean up events along the river. Volunteer Training – makes training available to all volunteers involved in the Living Wandle projects. The Living Wandle Partnership is always looking for volunteers, and there is a wide range of volunteering roles in the project open to everyone. These will be promoted through the Wandle boroughs volunteer centres, partner websites and social media. To volunteer for one of the projects please contact LivingWandle@wandsworth.gov.uk. Further details of the partners and projects can be found on the Wandle Valley Regional Park website.